Ever since I was old enough to form holiday memories, my favorite thing about the Christmas season has been eggnog. As a minor in the 1970s, of course, I was relegated to the cheap, artificially colored, gelatinous goop that was found in the dairy section of my local supermarket. Thickened with unrecognizable ingredients such as carrageenan and guar gum, it would be another 30 years before I discovered what proper eggnog should taste like. I spent many years early in my bartending career attempting to perfect a true, hand-made eggnog recipe. Given the dearth of good craft cocktail books in print in the late 1990s, I turned to the vast collection of cookbooks I inherited from my grandmother. But those 1950s-era recipes were filled with either fussy preparations (separating the eggs and beating them into a puffy froth) or bizarre ingredients (vanilla ice cream). Worse yet, they lacked the texture I wanted and often seemed to be damn near impossible to replicate in a bar setting—separating eggs to order or handling ice cream on a busy night would be a logistical nightmare. So I looked further into the past—to 1862 to be exact and the first published cocktail recipe book, Jerry Thomas' Bar-Tender's Guide (also known as How to Mix Drinks or the Bon-Vivant's Companion). 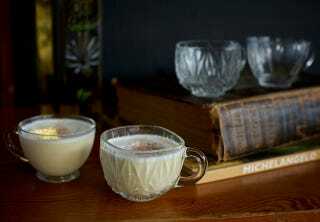 Inside I found an "Egg Nogg" that's remarkably similar to another style of drink in the book: a flip. A flip is an old style of cocktail sometimes made with brandy, rum or Madeira (or any combination of the three), a touch of sugar and a whole egg that's shaken with cracked ice and served with a dusting of fresh nutmeg. Thomas' eggnog recipe is merely a flip with the addition of milk. That's when it hit me. If the very first eggnog recipe can be prepared with basic ingredients (i.e., milk and eggs) and simple tools (i.e., a cocktail shaker), I could start offering the drink during the holidays at my bar. And so I did. Nowadays we make our eggnog in big batches for ease of serving, which also works in a punchbowl at larger family gatherings. But this recipe has always worked in a pinch, and it gives me the pleasure of introducing a new generation to a classic holiday cocktail, sans guar gum. Combine ingredients in a cocktail shaker and shake well with cracked ice until combined and chilled. Strain into two chilled punch glasses or small wine glasses, and grate fresh nutmeg over the top.